"A delicious, easy, curry chicken dish cooked entirely in a slow cooker. It's even better one or two days later, as leftovers. Your family will love it! 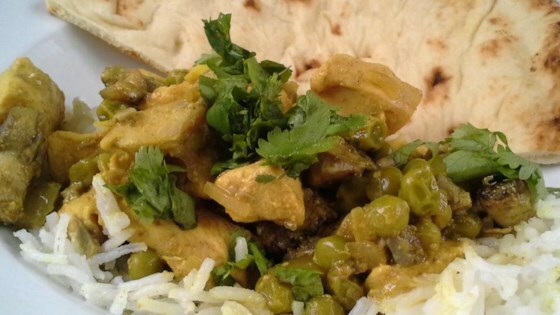 Serve curry chicken over rice, with naan bread and a salad and you have a wonderful meal (I serve it over brown rice)." Set the slow cooker to the High setting. Heat the butter in a skillet over medium heat, and cook and stir the onion until browned, 5 to 10 minutes. Set the onion aside. In a large bowl, stir together cream of mushroom soup, cream of chicken soup, coconut milk, dry soup mix, curry powder, salt, pepper, and cayenne pepper until the mixture is thoroughly combined. Place the chicken into the bottom of the slow cooker, and pour the mixture over the chicken. Stir in onion, peas and mushrooms. Cook on High setting for 1 1/2 hours, then reduce heat to Low and cook an additional 1 1/2 to 2 hours.